The weather world’s weather is getting screwed up with more and more extremes of abnormal weather. So here’s a brave rough guide to what to expect normally, but if it gets too hot / cold / wet, don’t blame the GT Rider! Late Feb – mid May. The weather is very hot, dry, dusty and hazy with a temperature range 20 – 42 Celsius. A good sun block lotion is recommended if you get sunburn easy. A balaclava is also recommended for extra protection, plus it keeps you a lot cooler from the sun. 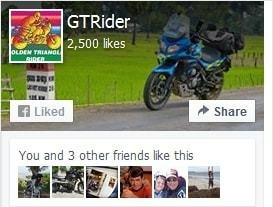 Keen motorcyclists who like riding in the heat and dust should consider touring during the hot dry season. March is the arguably worst month for touring, with bad visibility due to smoke from forest fires. Forest fires can be a nuisance in the hot season. Starting late March – early April, isolated thunderstorms can suddenly appear a couple of times a week, and make riding tiring if you get caught on a steep and winding dirt trail in the mountains. Late May – mid October, with August & September usually the wettest months. The temperature range is 22 – 35 Celsius. The first regular thunderstorms come in late May and increase in frequency until they become daily July – September. By mid – late October the rain stops. In November there are normally one or two final rainstorms. Keen bikers that enjoy the challenge of riding on muddy roads should consider touring in late September- October. The beauty at the end of the wet season in Mae Chaem. The rains are usually tropical thunderstorms of short duration 1/2 – 2 hrs. Once a month July – September there is likely to be a period of bad weather, with steady rain for several consecutive days. Unless you like the thrill of riding in the rain on slippery roads, this is an unfavourable time for enjoyable riding. Rain wear two piece light weight water proof suits are the best protection against the rain in the tropics. Riders should bring their own waterproofs as the only local rain wear – flimsy plastic ponchos – available do not provide adequate protection. I do not normally carry my waterproofs from mid December – January – March. So if there’s a lot of rain around you just need to know where it coming from – either the West or the East. If it’s coming from the west-south-west, then there’s a chance that the further east you go the less chance of rain. 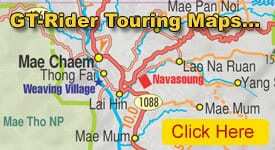 So if you’re starting from Chiang Mai then head towards the Laos border & Nan to get a dry ride. If it’s coming from the east-north-east, then there’s a chance that the further west you go the less chance of rain. So if you’re starting in Chiang Mai then head west towards the Burma border & Mae Sarieng / Mae Hong Son to get a dry ride. For help deciding where the rain is coming from take a look at these satellite pictures. 2. Wet weather storm alerts from the Thai Meteorological department. For rain forecast in your proximity there are some good rain radar apps which are quite accurate & reliable. I always check these out when I’m off on a longish ride 3-4 day plus ride & worry about where the rain might be coming from. The important thing when looking at the pictures is to see where the rain is coming from – the west or east. Then make your plan. If want to know whether the Mekong might flood check out Mekong river water level & floods. The Mekong in flood at Rai Saeng Arun resort 2008. In the wet season many National Parks in Thailand are closed. In Northern Laos note that the wet season usually starts earlier and finishes later than in North Thailand. Its also colder & for “longer” in Laos. I’ve been caught twice in southern Laos in early March & it has been cold with strong cold winds gusting & rain! Most of Laos’ serious rain should come from the east & the Gulf of Tonkin / China Sea & Vietnam way, so keep an eye out that way for incoming tropical depressions & typhoons. A cold foggy day in Northern Laos. November – early February. This is arguably the best time for riding with the weather cool and dry, and clear blue skies providing magnificent views in the mountains. The temperature range is 10 – high 20s Celsius, but night time temperatures in the mountains can go as low as 2-5 Celsius. Gloves and warm jackets are necessary riding gear. Note too that the daily temperature variation can be 20 degrees Celsius, with cold early mornings & very warm afternoons. Panoramic mountain views are subject to the local weather conditions. Generally the best views are just after the rainy season late October – late January, when the air is cool and dry with crystal clear blue skies. Keen photographers should consider coming in these months. A superb view of Phayao lake.